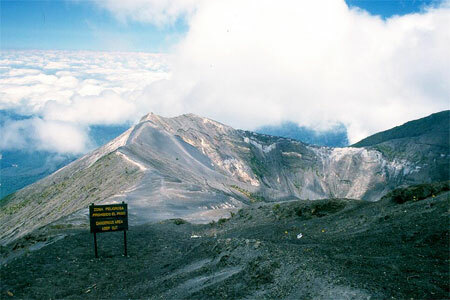 From Turrialba, it is easy to get to the Irazu volcano. By car, taxi ride from Cartago (31 km), or by bus from San José. As in many volcanoes in Costa Rica, better get there early (when the park opened at 8 am). Indeed, these volcanoes are very high and the clouds cling to it in the morning, depriving you of a fantastic view over the valley. In this condition, the dry season and with luck, you may be able to see the top of both the Pacific Ocean and the Atlantic Ocean. The Irazu volcano, which rises to 3,432 m above sea level, is indeed the highest volcano in the country. You feel: at this altitude, as your ears get blocked by air and the breath is shorter ... It is also quite cold. So plan warm clothing and wind even if it's sunny. At this altitude, it will probably not more than 16 or 17 °. You will reach, through trails, a long railing overlooking the main crater. At the bottom of it, a huge (1,050 m!) Sulfuric acid lake of intense emerald green. All around you, a moonscape of black volcanic sand and short vegetation and barren except for these superb sombrillas del hombre pobre (poor man's umbrellas) whose name clearly suggests the sheer size of the leaves. Continuing your stroll, you can see the other three craters of the massif. The last eruption (ash) of this volcano in 1963.